Every once in a while, there is something on the web that knocks my socks off. As many of the readers of this Weblog know, I was once an astronomer; my PhD is in that field from the University of Virginia. During that time, I studied the structure of spiral galaxies (1), (2), (3) like our own Milky Way. Our galaxy is a disk of stars with a very weak, perhaps only 5% mass enhancement in a spiral pattern. Gravitational disks are susceptible to such modes but such a mass enhancement if only that would not give the spirals such a striking and beautiful appearance. 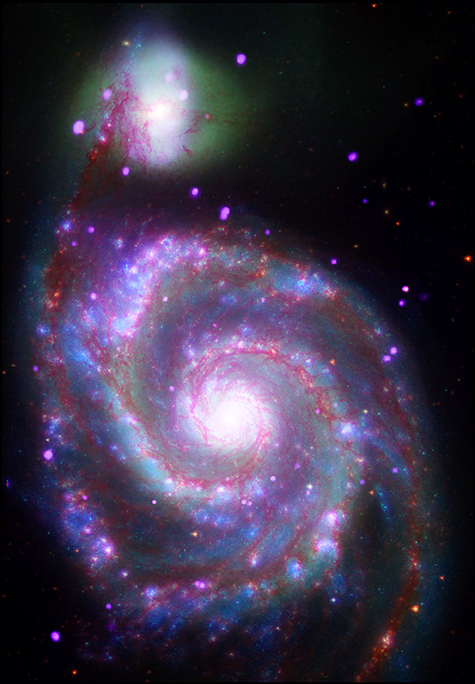 What makes the spiral pattern so very visible is the fact that with only such a small mass variation across the disk of the galaxy, the gas in the galaxy between the stars gets whipped into a spiral shock wave pattern. As the gas goes through this shock wave clumps of gas get compressed sufficiently that single and groups of stars are born in a spiral pattern. Most of the new star formation in these galaxies happens this way. Stars that are born this way can have various sized from 2-3x bigger than our sun to perhaps only 60% the size of our sun. Small stars burn very dimly,are more reddish in color and live VERY long times compared to our sun but big stars burn blue, are very bright and live very short times compared to our sun. The largest stars have lives of perhaps only 1,000,000 years compared to the expected life of our sun which is 10,000,000,000 years. So these young bright blue stars are essentially born and die in almost the same place. In a spiral pattern. So it is these big bright blue stars that give the spiral galaxies their striking visual appearance. 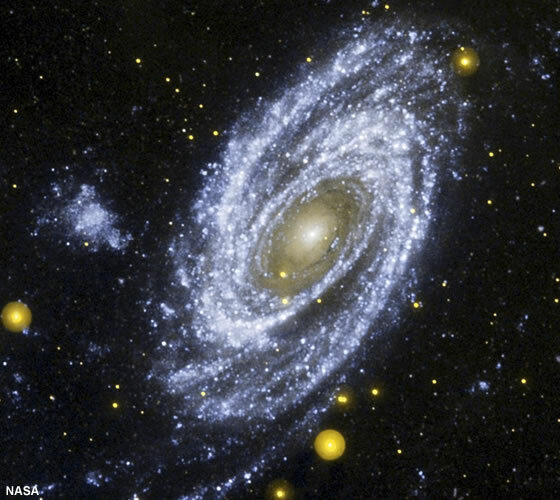 Seeing our own galaxy’s spiral pattern is tough because we live (our sun’s position) in the galactic plane so we see the spiral edge on and not from the face. One more point about the blue stars … when they die, the blow up in an event known as a supernova and for a short period of time during the explosion they burn with more light than all of the 200,000,000,000 other stars in the galaxy. Wow. After the supernova dims down that explosive event can be seen as an expanding bubble of gas in our galaxy. As these bubbles cool they can be quite visible in the infrared portions of the light spectrum. And that is the end of this lecture. This shows what we can see from earth of our galaxy in various colors of light. If you move the slider from the starting “visual” position to Hydrogen Alpha you can see the gas in our galaxy and then you see many gigantic bubbles. Each of these is the product of a supernova that happened some millions of years ago!